The Himachal Express train from New Delhi to Una arrives at about 8 A.M. Discover Yatra 's representative or cab will receive you at the railway station & then start your spiritual journey. The Devi Darshan Yatra usually starts by visiting Mata Chintpurni temple first. Mata Chintpurni temple is about 53 kms from Una. On way to temple you can have your breakfast at Bombay Picnic Spot which serves good food. On reaching Chintpurni temple have Darshan of Devi Mata Chintpurni Ji also known as Mata Shri Chhinnamastika Devi - the killer of demon Nishumbha.It is believed that feet of Devi Sati fell here. If anything is wished from the Devi with a true heart, wish will be granted. In the center of the Temple is the temple Garbha Griha. Later proceed for Jwala Ji temple which is about 29 kms from Chintpurni. 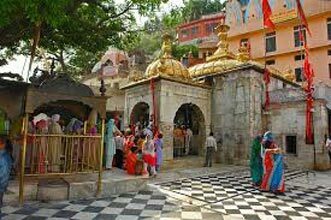 Seek blessings from Jwala Ji Devi & proceed for Kangra Devi(Brajeshwari Devi). The deity (Maata Brajeshwari) sits under a silver dome with silver umbrellas.Devi Sati 's charred breasts fall here. Overnight stay at hotel in Kangra or Chamunda Devi. 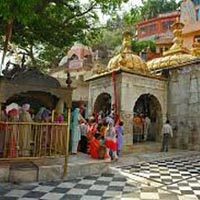 Reach Chamunda Devi temple which is dedicated to Goddess Durga or Chamunda & have darshan of Devi Mata Ji.The surroundings of the temple provide an excellent venue for meditation prayers and spiritual attainments. It is an enchanting and charming spot with fascinating view of the Dhauladhar Mountains, rivers and forests. The 700 years old temple, Chamunda Devi comprises of big complex with a Kund (pond) in it. There is a cave-like scoop located at the back of the temple, representing the stone lingam (embodiment of Shiva). (Optional) - If you wish we can take you for sightseeing tour of Dharamshala & Mcleodganj.Later proceed for Una. On way to Una visit the famous Baghla Mukhi temple. Bagalamukhi Devi is one of the ten Hindu Goddesses of Power. It not only decreases the power of the enemy, but also creates an atmosphere where they become helpless.The name Bagalamukhi has come from the word Bagala and Mukha that mean bridle and face, respectively. Thus, etymologically, the name stands for 'one whose face has the power to rule'. After reaching Una check in to hotel for nigh stay. Post breakfast proceed for Mata Naina Devi temple which is about 63 kms from Una. On way to Naina Devi temple you can have an enchanting view of Bhakhra Nangal Dam & Govind Sagar Lake-( Asia 's Largest Man Made Lake). After reaching Naina Devi seek blessings from Mata Ji. The temple is one of shatipeeths where Devi Sati 's eyes fell. In the evening return back to Una .We will drop you at Una railway station or Chanidgarh according to requirements.